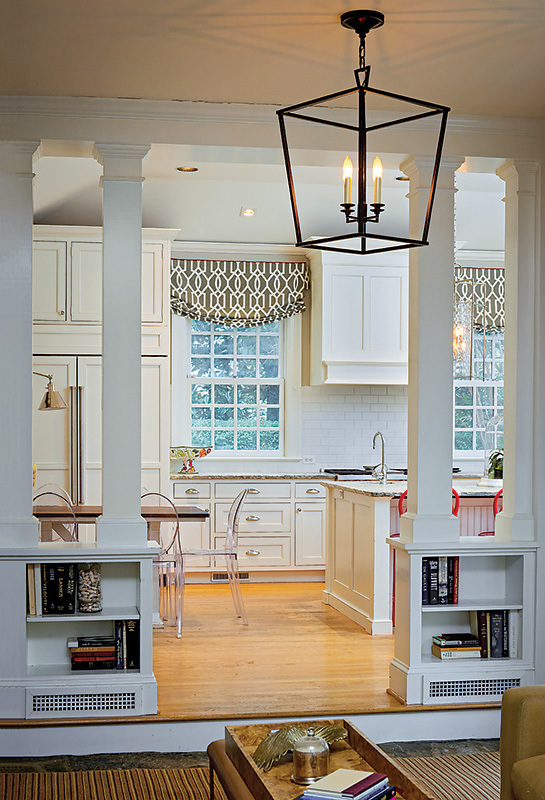 When Lilly Hunterand her husband, David, purchased their 1935 Homeland residence in 2008, the working mother of two didn’t see a problem with the original L-shaped kitchen. “At the time, we only had a family of four, and I don’t really like to cook, so I never thought the kitchen would be an issue,” recalls Hunter, an obstetrician-gynocologist at Greater Baltimore Medical Center. But by 2013, the Hunters had grown to a family of five. The kitchen, last remodeled in the 1980s, needed an upgrade. The top priority, Hunter says, was an eat-in space where all five family members could gather for meals, as well as better flow for entertaining. 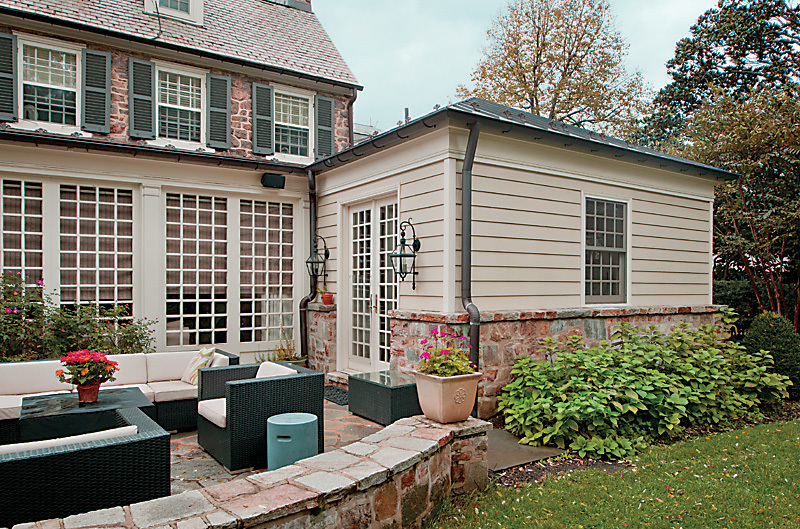 Extending from the southeast corner of the house, the addition mimics the neighborhood’s traditional early-20th century architecture with stone walls, paned windows, and a copper roof. “The roof is one of my favorite things, because when it rains and you’re sitting in the kitchen, you have this beautiful sound of the rain landing on the rooftop,” says Hunter. While the roofing material ended up being one of her most treasured parts of the new space, it was actually an element dictated by the neighborhood association. Designed in 1924, the historic northern Baltimore City neighborhood adheres to architectural standards intended to retain its original look and feel. For the Hunters, that meant submitting plans for the addition to the Homeland Association for approval. Many elements of the final design, from the paned windows and stone exterior to the copper roof, were dictated by the association’s guidelines. 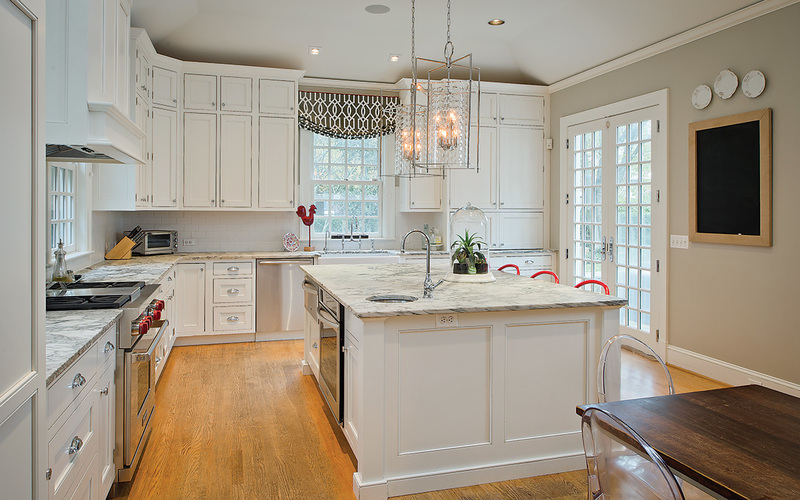 White shaker cabinets with crown molding brighten the space without challenging the traditional aesthetic, while chrome drawer pulls and knobs, a white subway tile backsplash, and a white marble countertop add a touch of contemporary style. 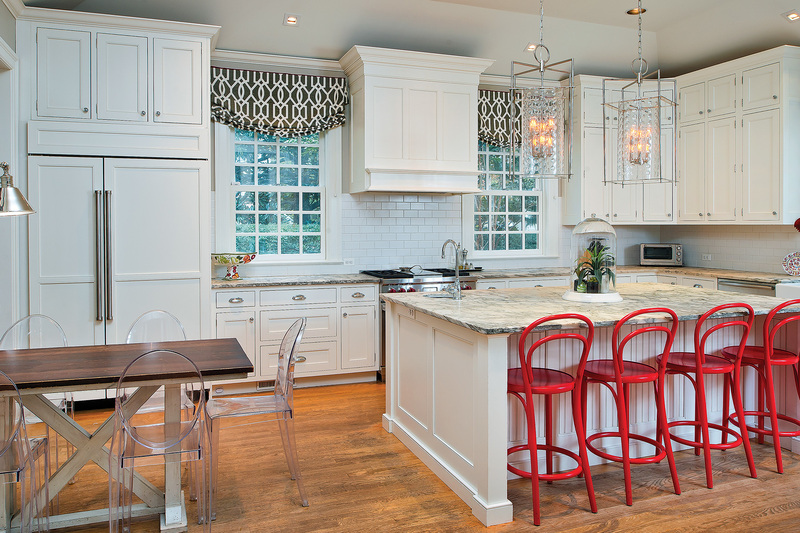 Bright red bistro-style bar stools echo the color of the knobs on the industrial-style range and add a vibrant pop to the otherwise monochromatic kitchen. A vaulted ceiling, so-called recessed “can lights,” and double paned doors leading to the patio flood the space with light. To help her pick the finishes, Hunter relied on designer Leslie Rose of Jenkins Baer Associates. 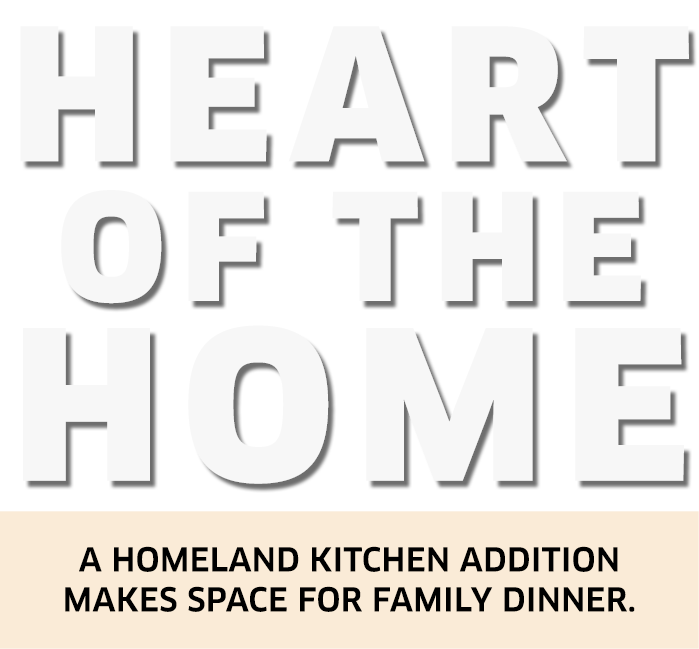 The biggest change, however, has been the way the Hunter family uses their kitchen. “It’s jaw-dropping when people walk in and see this kitchen compared to what it used to look like,” Hunter says with a laugh, noting that as guests progress through the renovated areas, the kitchen is the big reveal. “We get a lot of ‘oohs’ and ‘ahs’ when people come in.” Now, the space is large enough for the entire family to sit around the island for meals and for guests to hang out where they always seem to while entertaining—the kitchen.